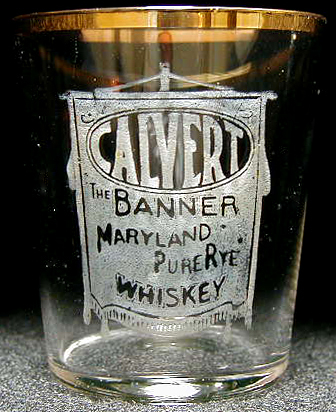 Inscription: CALVERT (frosted letters fitted to an oval) / THE BANNER / MARYLAND (wave) / PURE RYE (wave) / WHISKEY (reverse arched). (All tsp on a frosted tasselled banner hanging from a pole). Dimensions: 2-3/8" x 2-1/16" x 1-9/16"